Something may be unattainable for you now. But there are truly some simple things that, if done every day, will improve the quality of your life noticeably. 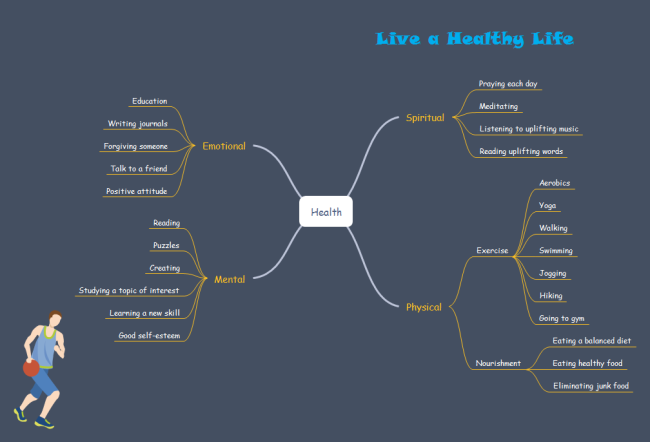 Find out these relatively easily attained things in the mind maps here. Generally speaking, you need to increase not only your physical power but also emotional and mental power. Health nowadays does not only mean physical fitness, but also emotional and mental health. If possible, you can seek for peaceful mind through religious beliefs. Mind maps are a great way to get things you should keep in mind down on paper - to make them easier to understand and remember. See it yourself by clicking on the hyperlinked picture. Life quality is determined by life style, from diet, exercise, leisure to sleep and social contact. 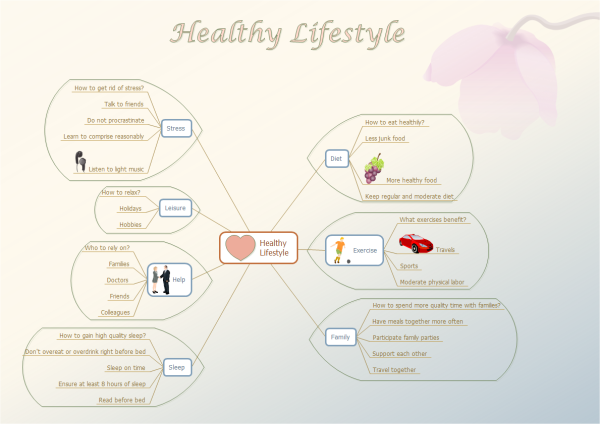 This mind map gives you the answers of 6 crucial questions related to healthy lifestyle. 1. How to eat healthily? 3. How to spend more quality time with families? 4. How to gain high quality sleep? 5. Who to rely on for help? 6. How to get rid of stress? Although some of the above things are tiny things, but if you stick to them, even tiny things can make big difference. It is your choice and action that decide who you will be. Therefore, start now and don't delay anymore, to get rid of bad habits and prepare for a brand new you. Add other shapes to make it more personalized like Basic Flowchart Shapes or Callout.